This post was originally posted on the Teaching4Tomorrow Blog. One of the most powerful moments in my 22 years of teaching occurred on the last day of the school year. During the first week of school, my students in rural Pennsylvania played a game via Skype with a group of students in a rural Kenyan village. During that call, they learned of a bridge in the village so dangerous that many children were not able to go to school because of it. Over the course of the school year, the children in Kenya taught my students how to garden. 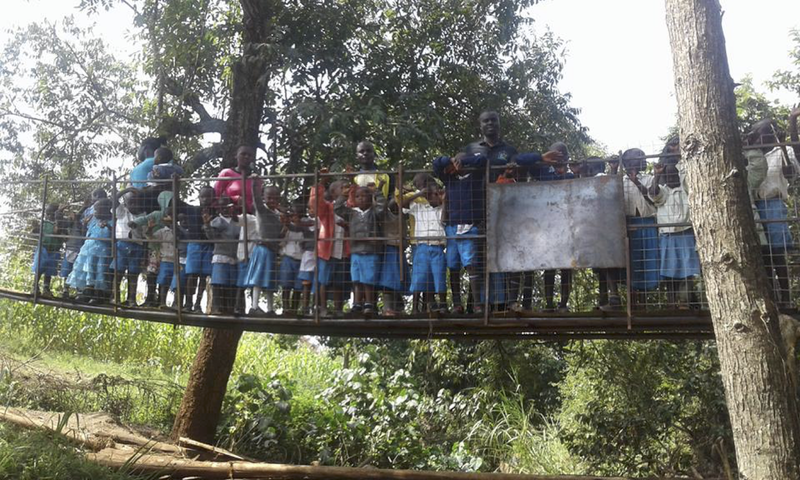 In exchange, my students designed and fundraised to replace that bridge. On the last day of school, I was able to share with my 5th grade students the picture I received of the completed bridge. Every one of the children in his village could now safely receive an education, and every one of my students learned how powerful they could be when they use learning to make the world a better place. Their unlikely friendship with children 7,500 miles away helped change not only how they felt about others who looked different than them, but also how they felt about themselves. Through global connection in our classrooms, we can teach our children how to be compassionate and empathetic. The key lies in helping students find a shared humanity with classmates and with others around the globe. We set the foundation for a peaceful future when we help students see each other as humans first, rather than through the lenses of limited identities that include race, ethnicity, religion, nationality, and politics. Most teachers want to foster empathy and a sense of shared humanity in their classrooms, but don’t know where to start. Luckily, we live in a time when free technologies exist that help us do this. Best of all, they are easy to use in the classroom. Empatico is a free tool for connecting elementary classrooms around the world. * It takes less than five minutes to register and get started. After choosing one of nine activities that connect to most school curricula, you enter the dates and times that your class is available to connect. The website automatically connects your class with another more than 300 miles away that is available at the same time and looking to do the same activity. My students are currently building relationships with friends 1,000 miles away in Georgia as they work on a joint science project. When children walk into my classroom and see the webcam and projector set up for a virtual call, they have trouble containing their excitement. For middle school and high school teachers, as well as elementary teachers looking for multiple connections, the combination of the Skype in the Classroom website and the Skype videoconferencing software can create amazing opportunities for students. On the website, you can find thousands of teachers from around the world willing to connect with your students. My classes love playing games like Mystery Skype, which is related to the game 20 questions, with new friends that they are meeting via Skype for the first time. When playing these games, you don’t have to worry about language barriers. If you are using the latest version of Skype on a PC computer, the program has a built-in translator that will allow your students to communicate, even if they speak different languages. I have seen many times how these classroom connections can lead to cross-cultural relationships and students finding a shared humanity. In the past few years, my students have broken through the isolation of our rural area to travel to 95 different countries, the International Space Station, and to Antarctica. I often get asked how this type of learning fits into the curriculum. We need to shift from the curriculum being the basis of our planning. Start by designing incredible experiences. Create the kind of learning environment that makes kids want to beat down the door of your classroom to be a part of it. Then find ways to attach the curriculum you teach to the experience. If we model the same creativity and critical thinking that we are demanding of our students, this should not be hard. Once we connect the curriculum to unforgettable experiences, students will retain the lessons we are trying to teach them forever. Start small by giving students opportunities to connect and learn with tools like Empatico. Then move into lessons like Mystery Skype that take a little more planning. When you get comfortable with those lessons, start looking for virtual field trips and other global experiences where your students can learn from scientists, authors, museums, and national parks. Before you know it, your students will be world travelers and they won’t have left your classroom. More importantly, they’ll be learning with others who live in different locations, have different backgrounds, and a different view of the world. They’ll be developing the skills to be empathetic and compassionate lifelong learners, and they’ll be gaining practice with the tools they’ll need to make the world a better place. Michael Soskil is a speaker, teacher, author, and host of the Education for a Better World Podcast. He is the 2017–18 Pennsylvania Teacher of the Year and was named one of the top 10 teachers in the world by the Global Teacher Prize in 2016. The book he co-authored, Teaching in the Fourth Industrial Revolution, has been called “an authoritative guide to teaching practice over the next three decades” and has been endorsed by world leaders in government, education, and business. To learn more about Michael’s work or to inquire about him speaking at your next teacher workshop or event, please visit his website at MichaelSoskil.com. *Disclosure: I have received compensation for consulting work with Empatico, which is an initiative of the nonprofit KIND Foundation, but the views in this post are my own based on experience.